I've got a large chunk of maple big enough for a one piece viola and probably another for violin. Some left over for sides depending how you cut it up. 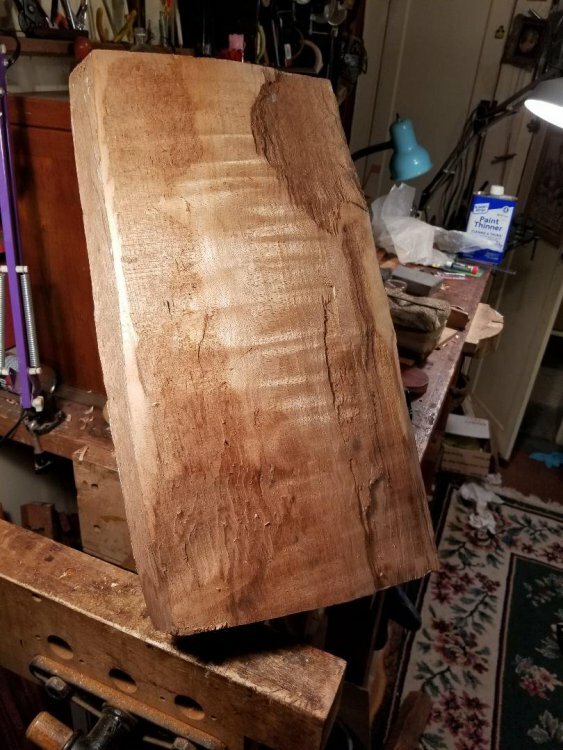 Could also be mandolin backs. Had it for thirty years, time to move and realize I'll never us it. Also lot's of guitar wood, Brazilian sets with receipts bought in the 80's before CITIES. Pernambuco sticks likewise photo'd and notarized as to ownership date. If you're looking for something particular let me know. I've got 40 years of lutherie to move and I realize I won't be using much of it. Hard to mystery shop without knowing what you got. Do you have box of f hole eye cutters in the back corner? I could be interested in specialty tools, resins, cello plans. For wood, I would be a pain asking for lots of pictures and asking questions. Probably big leaf cut in the 70s. Might also make neck blanks. 19inches long, no cracks. My other stuff id mostly bolts of wood from Guitar making days. Tools, I've got to think about. The idea of packing all this stuff is daunting. I'm still working at pegs and talpieces so I haven't thought it through yet. I might sell some tools, let me think about it and keep posted. I have a cookie cutter shaped like an "f". will that work? Only if it comes with fresh baked cookies. piece is sold, I'll be selling more wood. How thick does a fingerboard have to be? I've got several old guitar boards, I'll never use. I grabbed 3 FBs off the shelf. Eric, Are you moving out of Portland?...retiring? what's retiring? You have to have a paying job to retire from it. We are planning on moving to the Coast for a late life adventure while we still can cut our own toenails. I love wood as, we all do, and alway saw a future for it. I won't be selling any peg wood, yet. I've got bolts of old growth cedar and sitka as well as pre CITIES rosewood and some sticks. Are you still taking peg orders? Oh Yeah, It's just the time quotes that are up in the air. Wow, good question. Probably depends on the customs person. There is no real official cerificate of pre CITIES wood. I took photos and had the date notarized before the listing. It might be easier to send a board than sticks but then it's less easy to judge the stick. I guess any way you'd be taking your chances. 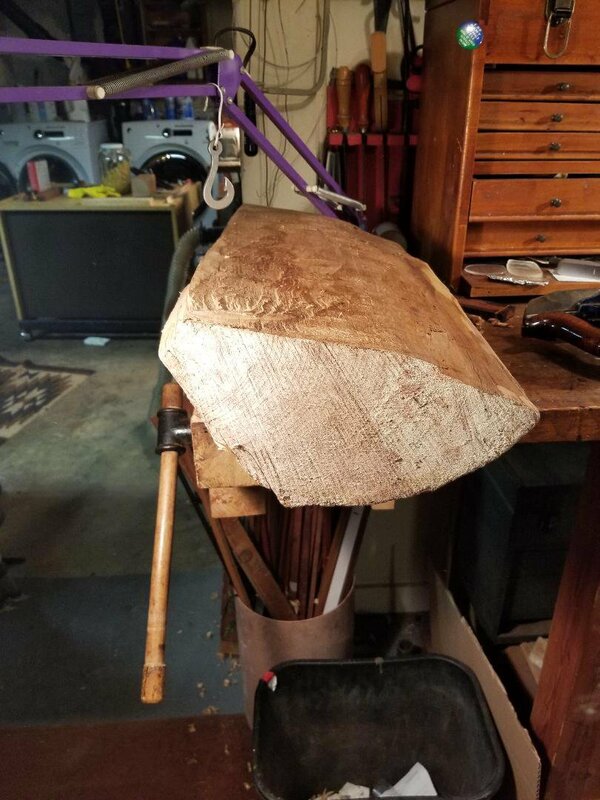 How many sticks does one board make? And do you know the density and Lucchi of the boards? I have different sized boards that i got ten years ago from Bob Shallock. I don't have lucchi on them. 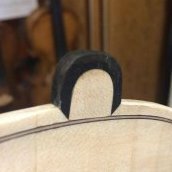 They are sinkers and cut to cello width. I can ask another bow maker about how to send them. You would have to be the one taking the financial risk I'm afraid. The trouble with the documentation is that it draws attention to the shipment and makes them make a decision as opposed to just slipping by. It's the same for me with mammoth ornaments on pegs. Are you sure those dusty old boards are pernambuco? From the picture that I can't see they look a lot like cherry to me. That's because the photo that you can't see hasn't been taken. I am interested in the Pernambuco, potentially. Can you please PM with more details? All the maple is gone.